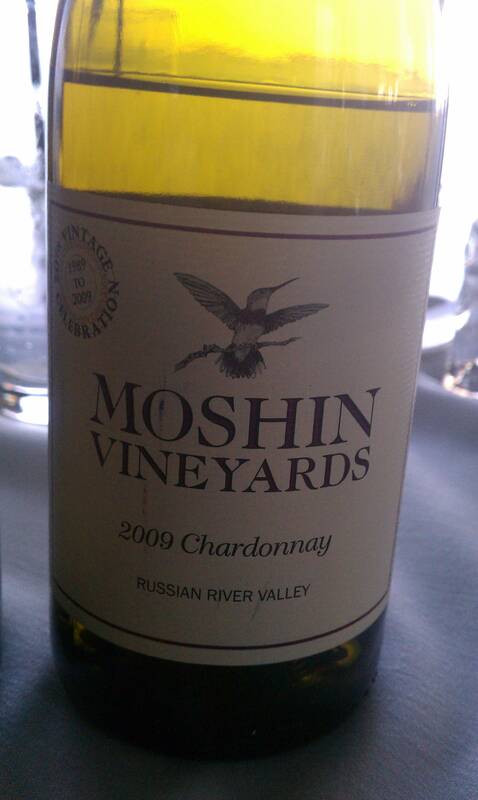 In 2009 Moshin Vineyards and Winery celebrated it’s 20th anniversary; 20 years as a crusader for balanced wines. The owner/winemaker is Rick Moshin who began making wine out of his garage in the 1970’s. His professional career included a 12 year stint at Gary Farrell where he solely focused on Pinot Noir. 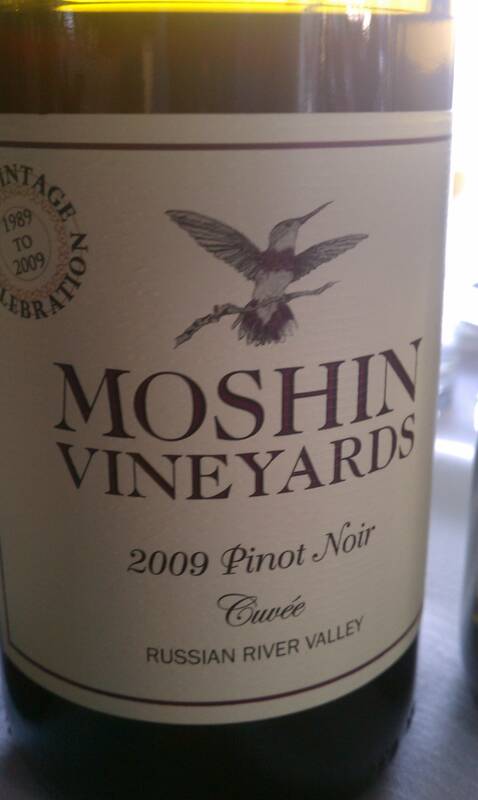 When he erected the Moshin Winery he chose to stay true to this finicky grape. In staying true, Rick uses biodynamic farming techniques in the vineyard and does not add sulfites, letting the natural acidity preserve the wines. The winery uses a gravity flow system so that very little human contact interferes in the temperamental juice’s journey in finding a resting place in barrel. Upon sitting down and tasting with Rick, he mentioned that his intention is to make Pinot taste like Pinot. This day in age other winemakers are pushing ripeness and the Pinot Noirs are loosing their inherent liveliness and acidity. At Moshin the opposite is true; pushing acidity rather than alcohol which ultimately, while in the glass, shows that it has a sense of place. 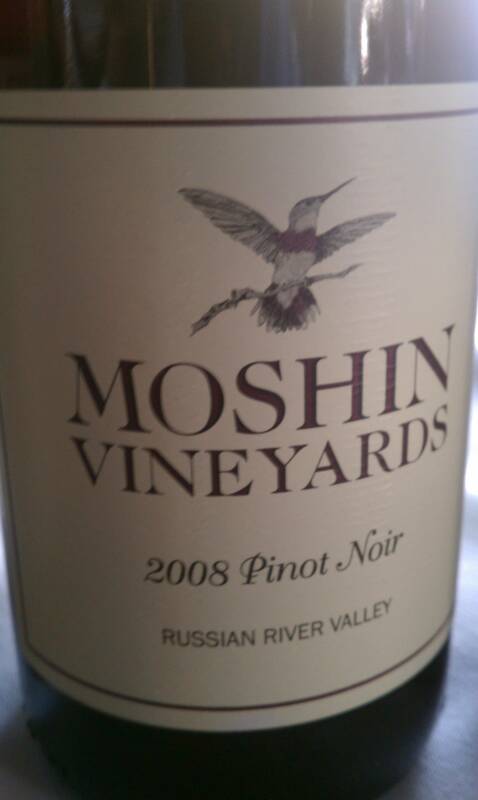 Moshin Vineyards is located on the Westside Road in the Russian River Valley. His neighbors are Pinot sensations, Gary Farrell and Rochioli. The iron rich soils and sandy loams are the secret behind these high quality Pinot Noirs. The Russian river has the potential to produce “Burgundian style” Pinot Noirs; but as of lately, wine makers here have been pushing ripeness levels and producing “juicy-fruit” Pinots. 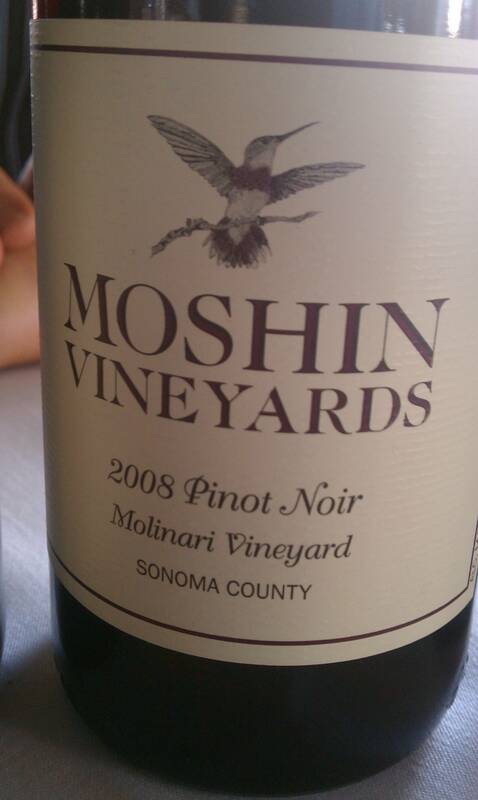 Moshin is looking to reverse this trend and get back to Pinot Noirs that can be drunk with food. Yes, Rick loves Burgundian varieties. However, his work with Merlot and Zinfandel is also noteworthy. The fruit for the Merlot and Zinfandel comes from his nearby vineyard in the Dry Creek portion of Sonoma. True to his style, these wines are lower in alcohol. Can you believe, a Zinfandel at 13.8%. 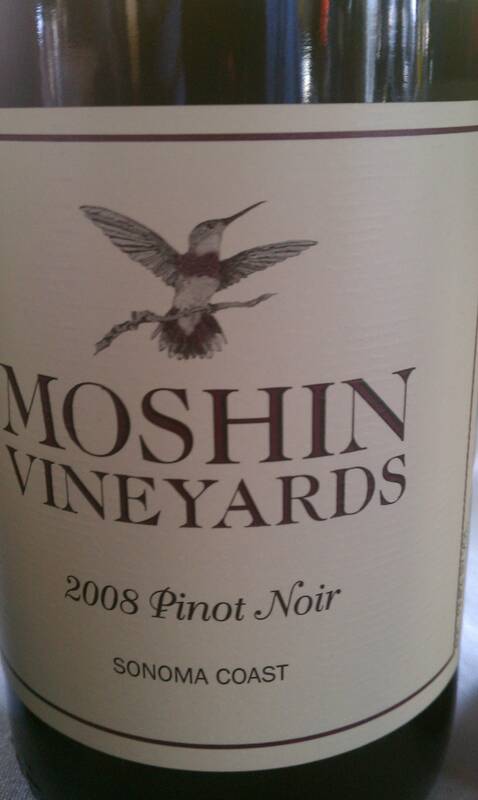 Moshin Winery is making wines for themselves. In turn, these wines will be appreciated by those looking for less alcohol and more structure. Yes, the scales are tipping and Rick Moshin is at the forefront of the crusade for balanced wines. Half of the wine is cold-fermented without malolactic fermentation and the other is fermented in 20% new barrels and sees some malo. The wine is tropical with other aromas of pear, apples and crème brulee. There is a crisp fresh acidity with flavors of lemon zest. It sits creamy on the palate with flavors of pineapples and has amazing structure. The wine is made from younger vines and is truly 100% Pinto Noir! It is cold soaked and aged 11 months on yeast sediments. I really enjoy the funky nose of earth and smoke. It has a pomegranate flavors and a velvety texture, finishing with bright acidity. This wine sees 11 months of French oak with 25% of it new. The soils are a bit more sandy. The aromas are of red berries, leafs, bush twigs and it is riper than the cuvee. There is a nice cranberry flavor that is intertwined with earth and orange zest. This will be served by the glass at Island Prime. This Pinot is labeled Sonoma County since some of the fruit comes from Rick’s vineyard on the other side of the road in Dry Creek planted with a Dijon clone. It is more structured with aromas of dried fruit, plums, and floral notes. On the palate it is bright with flavors of strawberries. Although there is a higher level of acidity, the wine is still soft and rounded. The finish lingers with a sense of wet stone on the mid palate. This project from the cooler Sonoma Coast is made with a Pommard Clone. The soils are more clay and the wine sees 35% new french oak. The fruit aromas are of cranberry, blackberry, with an underlining earthiness. The wine sits full and lush on the palate and shows flavors of violets and cafe mocha. The best part is that it continues to linger, and the longer it stays with you the more mineral notes begin to appear. With only 625 cases produced, this Merlot sees 15 months of neutral barrel. It exhibits aromas of red fruits, boysenberries and cassis. It is lively on the palate with the continuing flavors of red fruit and berries. The finish is long and the acidity is bright. The production is about 3400 cases. When the grapes are sorted, all the raisins are pulled out. It is cold fermented to retain fruit character and aged in neutral oak. The nose is intense with cherry, blueberry and raspberry aromas minus the alcohol. The tannins are present but feel soft and are more prominent on the finish then all up front. 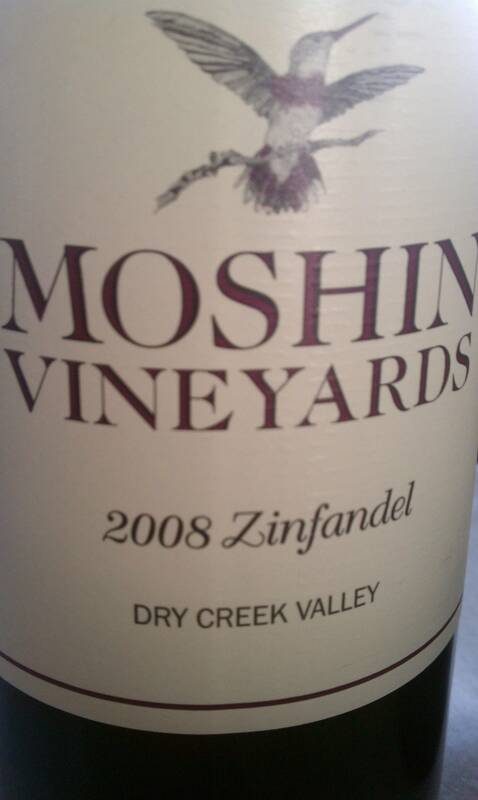 Best of all the wine has great acidity resulting in a delicious and balanced Zinfandel. 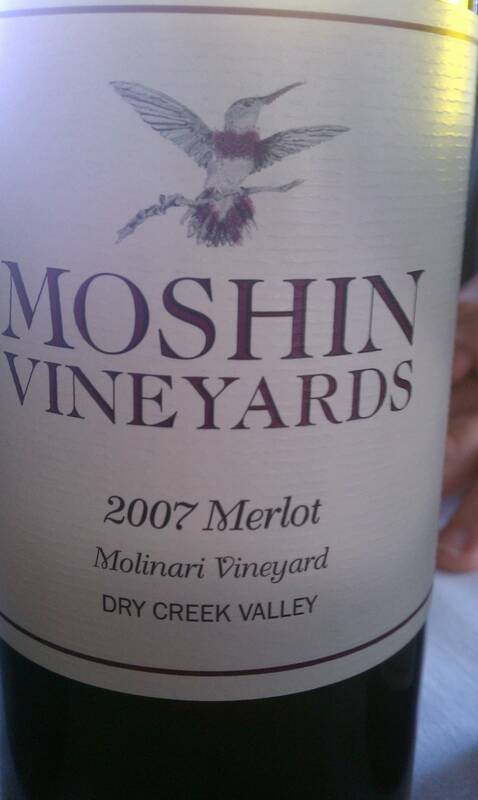 Fabulous write up on Moshin Vineyards. Thank you, their wines are great!